EMPATH: The Luckiest Smurf — Is There A Doctor In The Village? 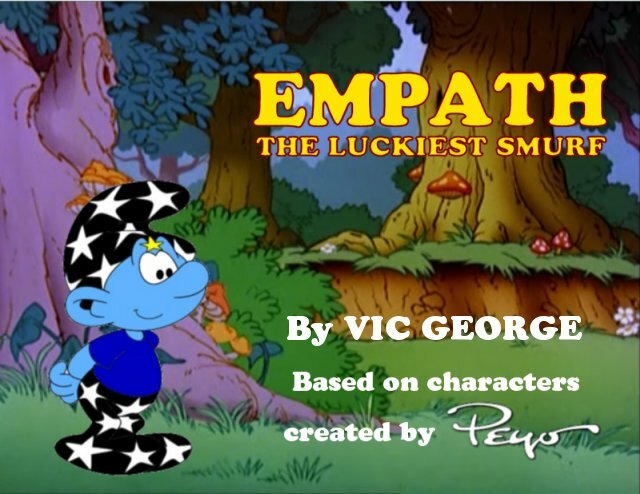 EMPATH: The Luckiest Smurf — Who's That Smurfette? NOTE: The SMURFS and their related likenesses are trademarks of Studio Peyo/IMPS Licensing. This fanfiction story series is not authorized nor endorsed by the current copyright owners. Empath -- the main character of his fanfiction stories. The biological son of Papa Smurf. Given the title of "the luckiest Smurf" by his fellow Smurfs due to his abilities. Papa Smurf (Culliford) -- the leader of the village. The biological father of Empath and foster father of the other young Smurfs. Previously known as Culliford or Cully in flashback sequences involving his fellow Smurfs. Smurfette -- Gargamel's magically-created female Smurf turned real Smurf. Has a romantic interest in Empath. Polaris Psyche -- Empath's friend from Psychelia, who has the same powers Empath has. Psyche Master -- the omniscient leader of Psychelia, where Polaris Pysche comes from and where Empath lived most of his first 150 years of living. Traveler -- Empath's great-grandson from the future who is a time-traveler. Also related to Smurfette and Polaris Psyche. Lillithina -- the wife of Papa Smurf, and mother to both Empath and Brainy (the latter through her fellow Smurf Aristotle). Brainy -- the village intellectual, and Empath's biological half-brother. Clumsy -- the village klutz and Brainy's closest friend. Likes to collect rocks. Hefty -- the village strongman, who constantly finds himself at odds with Empath. Handy -- the village mechanic and inventor. Greedy -- the village cook who really enjoys food. Deals with his brother Nabby who likes to steal food from his kitchen. Nabby -- Greedy's brother. Likes to eat food and has a tendency to steal things besides food. Grouchy -- the village sourpuss and a close friend of Empath. Vanity -- the village narcissist. Has a "twin brother" named Century, birthed in the story "The Hundredth Smurf". Jokey -- the village prankster, always looking for the next good laugh. Lazy -- the lackadaisical Smurf who enjoys taking naps. Dreamy -- the village adventurer who became Astro Smurf. He is also the captain of the S.S. Smurf II. Farmer -- the village farmer who keeps the village well supplied with food. Painter -- the French-accented village artist who enjoys working with paint. Poet -- the village muse who enjoys creating poetry. Sculptor -- a village artist who makes monumental works out of stone and clay. Harmony -- a village musician with rather off-key horn-playing skills. Mostly used as the village herald. Tailor -- the village clothesmaker who developed Empath's star-patterned suit. Sloppy -- the village garbage collector who likes smelly things. Also a musician who plays guitar. Tracker -- an explorer with an incredible sense of sight, hearing, and smell. Tracks the weather. Tapper -- the village barkeep and brewer who is a close friend of Empath. Speaks with an Irish accent. Barber -- the village hair cutter who keeps Tapper company when he's not working. Sweepy -- the village chimney sweep who keeps Tapper company when he's not working. Speaks with either an Australian or Cockney type accent. Miner -- the village spelunker with the Scottish accent. Tidy -- the village launderer who likes to keep his fellow Smurfs nice and clean. Actor -- the village thespian capable of mimicking any Smurf with uncanny accuracy. Dabbler -- the Smurf-of-all-trades with sometimes works as a doctor in the village infirmary. Nat, Snappy, and Slouchy -- refugees from Smurfling Island who settled in the Smurf Village in order to become adult Smurfs, collectively calling themselves the Smurflings. Nat loves to protect nature, Snappy is rather impulsive, and Slouchy is just laid-back. Sassette -- Smurfette's adopted little sister who is also part of the Smurflings. Baby Smurf -- the adopted infant with unusual and undocumented magical powers. Puppy -- the village pet who holds a locket that only Baby Smurf can open.